The other day a box arrived at my office. Carefully packed in foam was this lovely award from Inscape Publishing. 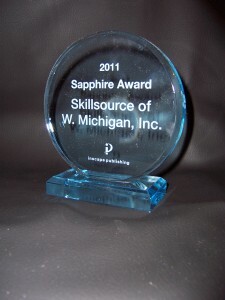 Although SkillSource has been an award-winning distributor with Inscape for sixteen years, I’d never bothered to select the physical “trophy” (as my son called it); opting instead for other forms of recognition that the company provided. It occurred to me that the award is way more than a physical reminder of my company’s sales success. It’s an acknowledgement of a successful business partnership. Since opening SkillSource’s doors in 1995, I’ve tried out several business partnerships—affiliate programs, distributorships, joint ventures, product development. Most alliances were “meh”. One stands above the rest— my affiliation with Inscape. Integrity. Everything is handled with honesty, professionalism and straightforwardness. From product launches, to communicating about new changes in company ownership, to policies for our distributorship, I’ve learned that when Inscape makes an announcement, it’s the real deal. If you’re considering partnering with an organization and you sense inconsistencies— don’t do the deal. The foundation of your relationship is based on your partner’s integrity. High-quality products. Are you super-excited about the value proposition your partner offers? When it comes to my Inscape product offerings, I most certainly am. Looking back on partnerships that didn’t work out, I realize that in some cases I jumped into arrangements where the products or services were not up to my standards. From that point on, I wasn’t fully committed to the partnership because I was secretly embarrassed by the product quality. Be sure anything that you associate with makes you excited and proud to talk about. Honoring the relationship. Inscape has made a commitment to distribute their products solely through independent consultants. They don’t sell directly on the internet. By honoring their distribution channel, they create confidence among those of us who help get their products to the marketplace. If you’re thinking of signing on with a group that has multiple ways to get to market—ask really tough questions to be sure that the arrangement will benefit both your potential partner and you. Investment. Inscape puts their money where their mouth is when it comes to training their distributors. We have many learning opportunities—conferences, webinars, and phone conferences designed to keep us up to date. Are your current partners doing the same for you? Research and development. Because Inscape publishes research-based self-assessments, R&D is always on their radar. They are continually striving to improve the product and make it relevant to today’s workforce. If your potential partners aren’t continually looking to improve their products, you may eventually find that your position in the marketplace is suddenly irrelevant. Consistent communication. How often do you hear from your business partners? How many channels of communication are there? As a distributor, I get monthly newsletters, access to a private distributor discussion board and connection points on social media. Fun to work with. This is a biggie for me. If I don’t enjoy the people I work with, it’s just not going to be that productive. Excellent customer service. In all the years I’ve ordered products from Inscape there has only been one error and that was resolved quickly and painlessly. Can you say the same for your business partnerships? Stability in leadership. The top leadership at Inscape has been around for many years, providing consistent, stable stewardship for the company. It’s reassuring that it hasn’t been a revolving door at the top. And when leadership transitions have happened, it’s communicated to us clearly and in advance. Recognition. I don’t do this for the awards—it’s really about numbers 1 – 9 above. But when the first nine are all in place, it sure is nice to get recognized for my hard work. Inscape has a long tradition of offering multiple ways to recognize and reward their distributors. Are you getting any acknowledgement of your contributions from your partnerships—either formally or informally? Forming a business partnership requires a big commitment. Pay attention to the factors listed above and you’ll be sure to set yourself – and your future business partner – for success. Previous post: Do Your Words Encourage or Deflate?